Is é Suva príomhchathair Fhidsí, san Aigéan Ciúin Theas. Is é an dara cathair is mó sa tír i ndiaidh Nasinu. Tá Suva suite ar leithinis ar chósta thoir theas an oileáin Viti Leva, an t-oileán is mó sa tír. 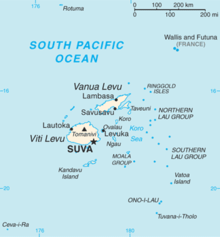 Sa bhliain 2009 bhí cónaí ar 88,271 duine in Suva. Tá timpeall agus 330,000 duine ina gcónaí, an tríú cuid de phobal na tíre, i mórcheantar uirbeach a chuimsíonn Suva, Nasinu, Nausori agus Lami. Rinneadh príomhchathair Fhidsí de Suva sa bhliain 1877. Inniu tá mórcheantar Suva ar cheann de na ceantair uirbeacha is mó agus is bríomhaire ó thaobh geilleagair agus cultúir de san Aigéan Ciúin Theas. Tugadh an leathanach seo cothrom le dáta an 28 Iúil 2016 ag 14:21.